A new Texas Legislature representative who is also an SHSU graduate, and SHSU's most honored faculty member will be speakers for December commencement exercises Dec. 14 and 15 in Johnson Coliseum. 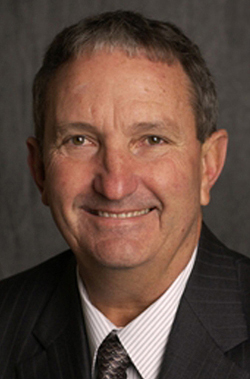 Rep. Mike O'Day who serves as a member of the Texas House of Representatives from Pearland (Dist. 29), will speak at Dec. 15 ceremonies for the Colleges of Arts and Sciences and Business Administration at 10 a.m. and Criminal Justice and Education at 2 p.m.
James Olson, the only SHSU faculty member to have won all three of the university's faculty excellence awards, will speak at the College of Humanities and Social Sciences ceremony at 6 p.m. on Dec. 14. Approximately 1,375 degrees will be awarded. O'Day was elected in a special election in 2007 to represent Matagorda and parts of Brazoria County. Glenda Dawson, also a Sam Houston State alum, held that office until her death last September. O'Day now serves on the Culture, Recreation & Tourism, Natural Resources and Redistricting Committees. He has also been appointed by the speaker of the house to serve as a member of the Energy Council, an organization designed to identify the evolving energy needs of the state. During the 80th session of the Texas Legislature O'Day worked to improve border security, lower the margin tax, keep religion in schools, insure pay increases for teachers and retired teachers, and for economic development in Brazoria and Matagorda counties. In addition to his service in the Legislature, O'Day is owner of O'Day Drilling Company. Beyond his professional service, he is an Eagle Scout, a member of First United Methodist Church of Pearland, a founding member of the Pearland P.O.S.S.E. (Pearland Promoting Outstanding Students Successful Efforts), and member of the Alvin/Manvel, Bay City, Palacios and Pearland Chambers of Commerce. He was named Volunteer of the Year by the Vic Coppinger YMCA and Outstanding Alumni for Sigma Chi Fraternity. In addition, he is a graduate of the Brazoria County Citizen's Sheriff's Academy and a former president of the Mid Coast Chapter and state director for the Texas Groundwater Association, and former board member of the Brazoria County Groundwater Conservation District. In 2006 O'Day was awarded the Congressional Medal of Distinction by the National Republican Congressional Committee for his support of the Republican Party, outstanding leadership in business, and contributions to the local economy. Most recently he was among 16 members of the House of Representatives honored by the Texas Eagle Forum for being one of the most conservative legislators of 2007. O'Day holds a Bachelor of Arts Degree in Business Administration from Sam Houston University and is a Life Long Loyal of Sigma Chi Fraternity. He and his wife, Connie, live in Pearland and have three children and three grandchildren. Jim Olson, distinguished professor of history, was honored recently as a Regents' Professor by SHSU's governing body, adding to his long list of accomplishments and achievements. In a resolution adopted by the regents, SHSU President Jim Gaertner called Olson the university's "most popular and highly regarded faculty member." That resolution further stated that Olson was named a Piper Professor for 2006 as well as the Carnegie Foundation Texas Professor of the Year (2005), he has authored or edited 47 books on such diverse topics as the Vietnam War, John Wayne, native American civil rights struggles, Catholic immigrants, and the history of cancer, and, he has established scholarships at SHSU as well as serving on numerous faculty and administrative committees. 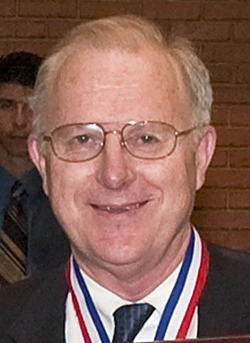 Olson won the Excellence in Teaching Award in 1977, Excellence in Research Award in 1988, and Excellence in Service Award in 2005. He and his wife, Judy, have four children and 16 grandchildren.